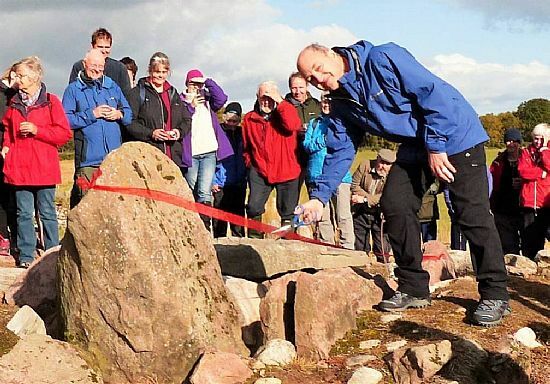 The restoration of Carn Glas, a Neolithic chambered burial cairn at the Heights of Kilcoy and one of the oldest known structures on the Black Isle, was recently celebrated as part of the 2015 Highland Archaeological Festival. Over 50 people ventured to the site, high on the Millbuie ridge, to attend a ceremony marking the completion of a community project between three local heritage organisations – Archaeology for Communities in the Highlands (ARCH), the North of Scotland Archaeological Society (NoSAS) and the North Kessock & District Local History Society (NK&DLHS). The cairn has long been regarded as one of the finest archaeological monuments in the Moray Firth area. It was first excavated by Lord Abercromby in 1906 who discovered a flint barbed and tanged arrowhead and sherds of beaker pottery, and was last excavated in 1955-56 by amateur archaeologist Dr Anthony Woodham who found a fine leaf-shaped arrowhead and a superb saddle quern, now in the possession of the National Museum of Scotland (NMS) in Edinburgh. After 1956 Carn Glas was neglected and by the new millennium it had become so extensively covered in gorse and accreted vegetation that the chamber was almost impossible to reach. Two years ago, the invading overgrowth prompted members of ARCH, NoSAS and NK&DLHS to take action to halt further deterioration and dilapidation of the structure. Funds were obtained from Archaeology Scotland’s Adopt-a-Monument scheme for the joint community project that has now re-instated the burial chamber as an outstanding Neolithic monument and as a visitor attraction. A new information board has also been erected on the site. It features text written by Dr Alison Sheridon, Senior Neolithic Curator at the NMS, and a commissioned sketch by Eric Allan, President of Inverness Art Society, of how the cairn might have looked after it was built about 3600 BC.